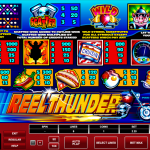 Reel Thunder is an entertaining video slot game from Microgaming. The story line of this game is quite interesting and unexpected we must say. We have a pig in helmet that hits the road and all the symbols represent things that you may find if you decide to take this adventurous journey too. In the background we can distinguish some rock and roll sound effects, a truly American theme which involves fast food, rock and roll and motor bikes. The real enjoyment in playing Reel Thunder is in the basics. We have a very simple slot with no special features at all. So, if you are craving for some free spins or mini bonus games than this might not be the slot for you, but if you are in for an old traditional game than you have come to the right place. It is not all grey in this game as some might think. We have some special symbols that will bring some thrill to the game play, if the fast pace game does not do the job. We have a wild that will substitute for every other symbol except for the scatter to complete a winning combination. Then the scatter offers pay outs and it does not have to be on an active pay line. 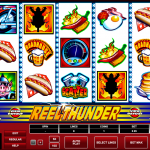 Reel Thunder is the perfect game for punters who like simple things. This is for old fashioned game players who miss the old times. The games were simpler and the wins were good, just like it is the case here. There are no special features that will keep you busy but instead the “road hog” will do it. You must admit this is one heck of a game with interesting theme, metaphorical in some way, but so entertaining. 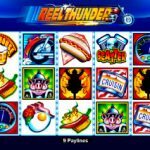 Do you like huge jackpots? Cashapillar a 5 reel slot by MicroGaming is exactly that with a potential winning of up to $120,000!! !